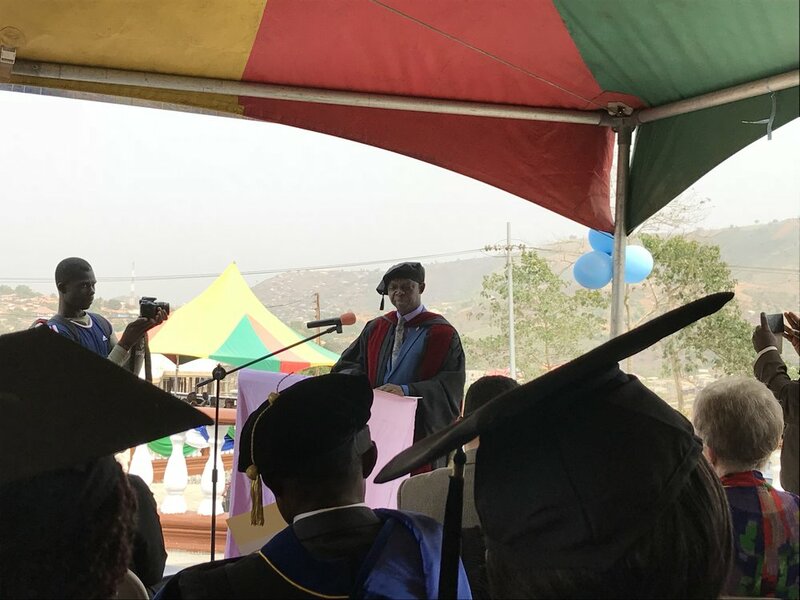 At the official launching of the United Methodist University of Sierra Leone, Bishop John K. Yambasu (Resident Bishop of Sierra Leone) shared his vision for this university. Born out of his missionary work with young people, the vision is an audacious one. I had planned to write a blog on the vision, but his words better capture the scope and hope of the University. You can find the video on my Postmodern Missionary Facebook Page. Also, kindly forgive the typos. They are all mine. “Your excellency, Sia Nyama Koroma, First Lady of the Republic of Sierra Leone; The Honorable Minister of Education Dr. Minkailu Bah;You Elcellences and members of the Diplomatic and Consular Corps; Our esteemed Keynot speak, the Rev. Dr. Kim Cape, General Secretary of the General Board of Higher Education and Ministry of the United Methodist Church; Our esteemed Guests of Honour, Bishop Rosemarie Wenner form Germany, and Roger and Melanie Reiner from Central Global Vision, Milbank, South Dakota, USA; My very good friend and colleague Bishop Christian Alstead of the Baltic and Nordic Episcopal Area; Members of the Board of Trustees of the United Methodist University; Our distinguished friends and partners from Germany, USA, Norway, and Liberia; Government Ministers and functionaries here present; Our esteemed heads of churches and ecumenical guests; Members of the Council of Finance and Administration of the United Methodist Church Sierra Leone Annual Conference; Clergy and lay members of the United Methodist Church; Mr. Vice Chancellor; Faculty and staff; Students; Distinguished ladies and gentlemen. "Today marks yet another milestone in the history of the United Methodist Church of Sierra Leone, as we gather to celebrate the inauguration of the United Methodist University and the official opening of the first of many Schools of the University—the Bishop Wenner School of Theology (BWTS). I therefore take this opportunity to welcome each one of you to this historic and momentous occasion. "The vision of the United Methodist University was borne out of my ten years of service and experience as Missionary of the United Methodist Church with responsibility for leadership development and training with youth, young adults,and United Methodist students’ movement in Sub-Sahara Africa. My many travels across the African continent opened my eyes to the massive illiteracy, poverty, misery, and marginalization and exploitation of young people and the helplessness of the vast majority of them to take responsibility for their own destiny. Majority of our young people in Africa still live in squalor and go through life threatening experiences every day because they lack the needed education and skills that will make them employable. Because of their extreme vulnerability, they are daily exploited and abused by unscrupulous politicians. They are given drugs and alcohol and then used as war machines to loot, kill, and perpetrate violence against their opponents during elections with a promise of reward of jobs. In the end, they are dumped and abandoned as garbage. Many who survive the ordeal roam our city streets as though they are aliens from a different planet harassing peaceful and unsuspecting citizens. Here in Sierra Leone, we are no strangers to this phenomenon. In a couple of weeks, Sierra Leoneans will be going to the polls to elect their political leaders for a five-year term. It is my prayer and hope that this year’s elections will be violence free, transparent and credible so that at least for the first time in decades, young people in our nation will be spared the tragedy of abuse and unnecessary loss of lives. “So for ten years, I carried this burden on my heart until December 2008 when I was elected Bishop by the West Africa Central Conference and assigned to serve my home country Sierra Leone. It was a God-given opportunity. God rekindled the burden in my heart; and in my maiden Episcopal address to the 2009 Annual Conference session, I presented a ten year strategic development plan which become fondly known as “Vision 2020”. The major goal of Vision 2020 was the establishment of the United Methodist University of Sierra Leone (UMUSL). "At the close of that conference, I received many calls from church members, most of whom were very close to me. Others decided to physically talk to me in person. While many applauded and tapped me on the shoulders for a well-articulated vision, many criticized me as being over-ambitious. Others out rightly said that it was an impossible venture and that I was getting too big for my shoes. “Where will you get the huge funds needed for all the projects you have proposed to implement, even more so to establish a university?” They asked. “To some extent, those critics were right. In 2008, Sierra Leone was still struggling back to her feet from the ashes of a decade-long rebel war. The economy was in shambles. Many investors had fled the country and were not sure of their return. Unemployment was at its highest. The vast majority of Sierra Leoneans were living in hopeless conditions. Worst of all, the United Methodist Church itself was going through some real difficult challenges as church giving declined to the lowest. To undertake such a gigantic project that needed huge financial capital would not only seem insane but a hopeless endeavor. “Yes! The United Methodist University is a dream come true. It is the product of a bold and glorious vision spiced with decisive action. I thank all those who believed in me and became the Aarons and Miriams to hold up my hands as we struggled together through challenging economic landscapes, prompting, encouraging, and supping me to achieve this laudable dream. “Let me again give you another quote from one of our major national tabloids the “AWOKO” Newspaper of Saturday August 6, 2016, where one of Sierra Leone’s most renowned journalist Umaru Fofanah published the following article titled “Sierra Leone News: Brain Drain of Doctors Costs Salone Millions of Dollars”. I am quoting Mr. Umaru Fofonah verbatim ET literatim. “”Recent studies have show that lack of doctors in Sierra Leone is costing missions of dollars as more than half of the doctors trained by the College of Medicine and Allied Health Sciences have left the shores to work in developed countries where they aim to prosper. “"During the Ebola crisis, the ratio of doctors to the population of Sierra Leone was one to 15,000. Current the entire country has less than 300 Sierra Leonean doctors working in the country. “”According to the Chicago Tribune, the number of Sierra Leonean doctors working in Chicago surpasses the total number of doctors working in Sierra Leone. Sometime in 2010 the newspaper reported that 376 Sierra Leoneans doctors were working in the city of Chicago. The problem is not only in Sierra Leone but all over Africa. A Kenya Cabinet Secretary for Education, Dr. Fred Matiagi…said media experts are emigrating to the West due to poor pay and low level of scientific research. He said the number of qualified doctors moving abroad to work in the West has been high over the years, as such sub-Saharan African countries have ended up losing 2 billion dollars as the clinicians seek work in more prosperous nations. The Kenyan official named Ethiopia, Sierra leone, Kenya, Malawi, Nigeria, South Africa, Tanzania, Uganda, Zambia and Zimbabwe as having suffered the worst economic losses due to the clinical brain drain which Australia, Canada, Britain and the United States have benefited the most from recruiting doctors trained in Africa. “The migration of trained health workers from poorer countries to richer ones exacerbates the problem of already weak health systems in low-income countries battling epidemics of infectious diseases like HIV/AIDS, Tuberculosis (TB), malaria and lately ebola,” Matiagi said. “”The BBC reporter further goes on to state that “In a short interview the Chinese medic Dr. Jiang working at the 34 Military Hospital, there is a strong relationship between education and development, with studies having show that increases in educational attainment precede improvements in health status. “This relationship between education and health arises because higher education leads to healthier lifestyle, and because higher educated people gather, process and interpret information about healthy behavior better.” …A statistic is circulated that one in every twenty three delivering mothers in Sierra Leone gives her life that another life may be born. The recent Ebola crisis (which led to the death of 11 medical doctors in Sierra Leone) also highlighted the continent’s doctor shortages with for example Uganda, with a population of 35 million people registering less than 5000 doctors and 30,000 nurses. The resulting shortage of qualified faculty in African universities, especially in the scientific and technical fields, affects the quality of graduates entering the industry workforce, with 11 million new graduates entering the African job market annually devoid of the relevant skills to develop African solutions for African challenges,” the tabloid concludes. “Distinguished guests, Ladies and gentlemen, in the few sentences, Umaru Fofanah lays bare the socio-economic predicament in which the African continent, and in particular Sierra Leone, finds itself. I could go on and on and on citing one compelling reason after another for the establishment of another university in Sierra Leone and for that matter a United Methodist University. “Our nation is suffering form a massive brain drain. Our economy is one of the worst in the sub-region. The United Nations rates Sierra Leone as the nation with the highest maternal child mortality in the world. The 2017 Global Hunger Index jointly published by three renowned international organizations, namely the International Food Policy Research Institute (IFPRI), Concern Worldwide and Welt Hunger Life refers to Sierra Leone as the hungriest nation in the world. Our illiteracy rate (73%) is one of the highest in the world. A major reason for the unprecedented death rate during the Ebola epidemic. Once known as the Athens of Africa, Sierra Leone’s educational system today is nothing to write home about. This can be dangerous for a nation. We need a sound and competitive educational system geared toward entrepreneurship and development. We need an educational system where certificates and degrees are earned by hard work rather than extraneous relationship between students and lecturers. "At UMU, we will continue to improve, innovate and enhance our academic products to meet both national and international expectations. I dream of an educational institution of excellence where students, faculty, administrators and researchers from across Africa and the world will converge for research and exchange of knowledge. “Our students who pass through UMU will be nothing but the best - God fearing leaders, preachers, Christian educators, agriculturists, administrators, entrepreneurs, business executives, engineers, health professionals, scientists and of course decent politicians. “To achieve this goal, we plan to establish a University Preparatory College that will not only strengthen but serve to provide and maintain a constant flow of highly qualified students to feed the University. In addition, we will strengthen our United Methodist High schools so that they become the industries that will manufacture the raw materials that will feel the University. "Through our diversified curriculum which shall incorporate programs such as Strategic Development studies, Marine Biology, Civil, Electrical and Mining Engineering, and our robust programs in Medicine, Agriculture, Gender, Good Governance and Human Rights Studies, the UMU will help create opportunities for the present and future population by ushering in sustainable development, reduction of poverty and help create a democratic and peaceful society where respect for law and order is evidenced. “I vision the United Methodist University to be a place where students rediscover themselves and where dreams come true. The United Methodist University will be the first in Sierra Leone to introduce an effective hybrid (blended) learning in which classroom sessions are combined with online courses to allow students the flexibility to do more work on their own time while still providing the traditional face-to-face classroom interaction of students an lecturers. Our programs will be designed in ways that enable students to watch lecturers online or on videos on their own time and use actual classroom time for face-to-face interactions on group projects. Opportunities for cross cultural experiences and research through student and faculty exchange programs with partner universities in Africa, the US, Norway and Germany will constitute a major part of our academic program. Such partnership will place us on a road to fulfill our commitment to providing an innovative world-class education for our nation’s future leaders. To position us for this risk-taking enterprise, we will equip each campus on the University with one of the highest Wifi internet facilities so that students and lecturers can access the internet anywhere within the premise. Here at the Bishop Wenner School of Theology, all our faculty and first year degree and diploma students have been provided with one free lap top. Our Theology Library has more than 2000 volumes of books and reference materials, eight desktop computers, and printers so that students can download and print reading and research materials. “Our vision goes beyond just providing students with higher education. The longterm vision is to create an institution with state of the art facilities including quality faculty and programs. The university will initially be established on two campuses here in Freetown - one campus at UMC Pa Loko and one in Bo. In the years to come, more campuses will be established across the country to make university education accessible to all. On each campus, we are developing an infrastructural plan that strives to provide a framework for growth and innovation as well as for preserving the heritage of natural beauty. At the Bishop Wenner School of Theology here at Leicester peak, the plan is to build a chapel right on top of the rocks behind us. On the far end will be the student hostels and behind this academic building will be housing for our international adjunct professors. In the next two years, we plan to extend the northern end of the main building to accommodate the graduate program. The flower garden on my right was planted by Bishop John K. Yambasu and donation to the school In the years to come, these and other flowers will grow and add to the natural beauty of the campus. In short, our campuses will be the place where nature and man walk, talk, and work together in a harmonious relationship. “Distinguished ladies and gentlemen, you can see for yourselves that UMU isn not going to be “business as usual”. It will be an institution that offers the highest academic, moral and ethical education. This is why we are so happy today to have all of you present as we begin to write the first chapters of the history of the Untied Methodist University. On behalf of the Board of Trustees, I heartily welcome you all to this event. “First and foremost, to God be the glory great things He has done. For the countless times I have travelled in and out of this country sharing the UMU dream and raising the needed funds, for health and strength and for providing me with a great team of committed dream partners and for opening the heart of men and women to share in this dream. I say THANK YOU GOD. "To our General Agencies of the United Methodist Church including the General Board of Higher Education and Ministry (GBHEM), the General Board of Global Ministries (GBGM), the General Council on Finance and Administration (GCFA), the General Board of Discipleship (GBOD), the United Methodist Women and the United Methodist Communication (UMCOM), I say thank you for journeying along with us this far. I look forward to an even greater partnership with you as we move into the future. “I recognize the invaluable contributions made by our friends and mission partners from the United States, Germany, and Norway without which this dream will not have become reality. In appreciation of their support, the Board of Trustees has unanimously voted to honour three of these esteemed friends and partners at this event. They will be duly recognized at the appropriate time. “I recognize the huge and invaluable sacrifices of time, energy and commitment invested by the University Development Committee under the leadership of our chairman, Professor Thomas Yormah, over the last nine years. I have never been so blessed with such a formidable dream team. Thank you all for working round the clock helping to give form and shape to the UMU vision. “I am deeply grateful to the Conference Council on Finance and Administration under the leadership of Mr. Amadu Ndoeka for believing in my dream, and giving its unreserved support of the work of the University Development Committee. “Many Sierra Leoneans at home and abroad, whom I cannot now name here for want of time and space have made generous financial contributions to the development aspirations of the University. Please know that we deeply appreciate your invaluable contributions and we look up to you for your continuous support. “To you my esteemed members of the board of Trustees, THANK YOU for accepting my invitation to serve on the UMU Board. I have every reason to believe that together we will transform UMU into a leading institution of higher learning not only in Sierra Leone but in Africa and the world. “Somebody wanted to know where the best Christian workers in the world could be found. I simply replied UMC House, 31 Lightfoot Boston Street, Freetown. To all my administrative, program and support staff, to all my District Superintendents and pastors, I say thank you for all your support. You are simply the best. “And finally, but by no means the least, to my dear wife and honey Mrs. Millicent Yambasu, words are inadequate to express how deeply I appreciate you. THANK YOU for the countless times you have prayed for me and supported me. That you for providing the spiritual shoulders I have heavily leaned on in those time when I am weak and needed someone to lean on. “To God be the Glory great things He has done."